What Do Each Of The Chakras Represent? Are there more than seven chakras? Yes there are indeed! As you progress on your spiritual journey you may begin to hear and see more about other chakras in the body. In addition to the seven major chakras, there are said to be another five chakras - totalling twelve. However in addition, there are said to be 21 minor chakras which are reflected points of the major chakras. And in some texts you may read of up to 114 chakras in the subtle body! 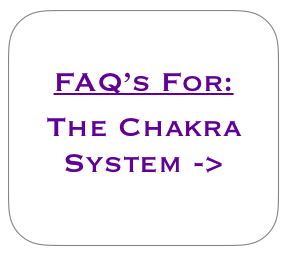 There are many variations on where each of these additional chakras are located, however the two main additional chakras that you may hear of most commonly are the Soul Star Chakra and the Earth Star Chakra. You can see one representation here on the right which shows the location of the Soul Star and Earth Star Chakras. The Soul Star Chakra is usually shown sitting above the head. It is white and gold in colour, or sometimes magenta, and is said to be the catalyst to heightening our relationship with the Universe. Once awakened (when the soul transcends the ego) it allows people to experience a more enlightened, joyful and wonderful physical existence. The Earth Star Chakra is usually shown sitting below the soles of the feet. It is often brown or dark red-brown in colour and is the grounding point of the entire chakra system (in contrast to the base chakra which is the grounding point for the seven chakra system). The Earth Star Chakra helps us to feel deeply connected and anchored to the earth and also the universe. These two chakras are far more expansive than our seven central chakras and only after much spiritual work will these chakras ‘come into focus’. They send an ever expanding frequency of light outwards to all realms of the infinite cosmos and in this way they are powerful healing, meditation and energy vortices. The Soul Star and Earth Star chakras also work well in combination with one another. For example, as one experiences the incredible connection to the universe through the Soul Star chakra, it can be so expansive that it is important to simultaneously ground ourselves through the powerful anchoring force of the Earth Star chakra.